Generation Group’s partners are Steven Blexrud and Daniel Nycklemoe. The partners share a combined experience of over 40 years of planning for our clients. Our firm is dedicated to planning not only for you, but for your heirs. Generation Group’s family of advisors also includes Edmund Speck and Christopher Leivermann as well as our dedicated support staff. Steve began his career in 1985, upon graduation from Augsburg College with a degree in business administration and economics. He has been in the insurance and financial industry his entire career, now nearly 30 years. He is founder and managing partner at Generation Group. His approach with clients is relationship first, then education and information that expands the conversation around the many complex products available in the marketplace. He specializes in designing strategies around financial products that can help toward maximizing financial wellness. Interests: Steve enjoys spending time with his wife Laurie and their two children Corey and Mallory. Other interests include golf, nutrition, fitness, travel, reading and sports. Dan graduated from St. Olaf College with a degree in Theater. Dan has been working in the financial services field for over 10 years working for such firms as Foster Klima and Company, Ross/Johnson and Associates, and now as a partner with Generation Group. Dan’s background was first in managing operations and all facets of case analysis, investment management and client service. He then began working directly with clients on their planning needs and goals. Dan’s focus is to manage the firm’s operations, while also working with all clients on effective cash flow management, strategic planning and overall financial and personal well-being. He also spent over 13 years in the professional theater working as an artistic director, actor and designer. He produced numerous shows in Minneapolis and produced Off-Broadway in New York City. Organizations/Memberships/Awards: Aliveness Project, MN Autism Society, Theta Alpha Phi, also a supporter of numerous theater organizations. Family and interests: Dan lives in Minneapolis with his son, Asher. Dan enjoys film, playing and recording music, live theater, good scotch and hiking. Ed Speck is a key contributor to the Generation Group. He is an Honors Graduate of Bethel College, Double Major in Business and Economics, and has his Masters of Business Administration from Minnesota State University at Mankato. His career includes responsible management roles in Honeywell, Alliant Techsystems, EF Johnson, Carlson Companies and Imation. With over 25 Years of Business Experience, including conducting business in 25 countries around the world, his experience and business acumen is a valuable commodity to his practice and his clients. When Ed entered the financial services business in 2002, he did so with a purpose. His caring approach and thorough understanding helps make the complex world of financial services understandable – tailoring solutions to specific client situations. Organizations/Memberships/Awards: Donate Life MN, Edinbrook Church, numerous missions, Member and Former Board Member of Saint Andrews Club and Ediburgh USA Men’s Golf Association, Volunteer at Second Harvest Food Distribution and Feed My Starving Children. Family and interests: Ed and his wife Judy reside in Brooklyn Park, just off the Second Tee at Edinburgh USA. Easy to guess: Ed’s hobbies include golf, family and a myriad of other activities. Being a successful and involved father of three, Ed has enjoyed watching his children grow and accomplish a number of their goals. 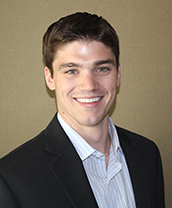 Chris began his career in the financial industry after graduating from the University of St. Thomas in 2013, with a degree in Finance. He joined the Generation Group team as an advisor in January 2014. As a second generation financial advisor, Chris brings passion and energy to his practice and strives to help his clients maximize their financial wellness. Family and interests: When Chris is out of the office, among spending time with family and friends, he enjoys golf, the outdoors, travel and sports.